With our co‐managed approach to security monitoring, we work in collaboration with IT staff. We monitor the most critical devices that require 24x7 attention, and in‐house IT staff monitor internal devices and endpoints. Our SOC leverages sound and repeatable processes to mitigate threats in a systematic approach. 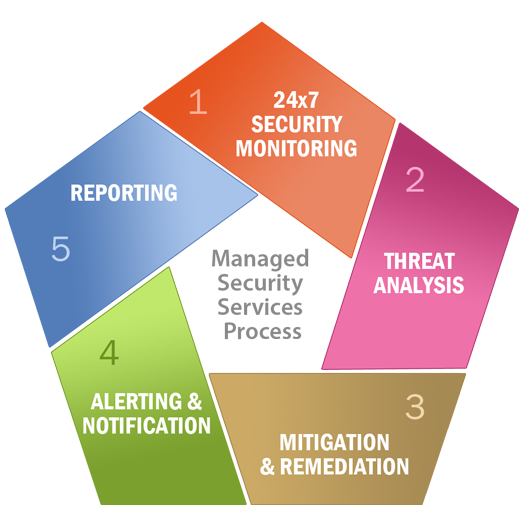 Threats are analyzed in real time by InfoSight® Security Operations Center (SOC) analysts and individual cases are created for all threat analysis performed. Device management and monitoring of Firewalls, Intrusion Detections/Prevention Appliances, Host IPS, Active Directory and Endpoint Security platforms can all be included in an affordable service offering. Additionally, incident‐based reporting is included for all threats analyzed and mitigated during the month. Security & Infrastructure Monitoring services ensure your network is safe 24 hours a day, 7 days a week. Our managed security services fit into any budget with minimal upfront cost or capital outlay. Our consolidated real‐time alerts and Security Compliance Summary Report help alleviate the painful process of executive management and board reporting required by numerous regulatory agencies. InfoSight’s Managed Information Security service enables efficient and cost‐effective deployment of a broad defense and response strategy and is enhanced through faster provisioning and implementation of instant global updates. Experience the difference with InfoSight® and see how quickly you can detect, prioritize and respond to threats. To get started, call or email us today. The InfoSight SOC monitors and performs threat analysis 24x7 for firewalls, IPS, NIDS, HIDS, Endpoint, and more. Client notification can be customized to include multiple response scenarios. If threat analysis determines this is a false positive alert, there will be no notification. If threat analysis determines this is a “low or informational” alert, there will be no notification, but logging will occur. If threat analysis determines this is a “medium” alert, if requested, an email can be sent and logging will occur. If analysis determines this is a “high” alert, there will be an email or phone call made to the customer per the call escalation procedure and logging will occur. Alarms ‐ Reports on top alarms, top attackers, top attacked hosts, and top destination ports. Assets ‐ Reports on assets, including asset properties, vulnerabilities, events, alarms, and raw logs for selected assets. Compliance ‐ Reports on various compliance regulations, including FISMA, HIPAA, ISO 27001, PCI 2.0, PCI 3.0, PCI DSS 3.1, and SOX. These reports display information such as events, alarms, and asset, and map them to compliance requirements. Raw Logs ‐ Reports on raw logs from different sources, such as firewalls, IDS/IPS systems, mail security devices, and anti‐virus applications. Security Events ‐ Reports on security events from different sources, such as events coming from firewalls, IDS/IPS systems, mail security devices, and anti‐virus applications. Security Operations ‐ Reports on security operations including tickets, top alarms, and top security events. Custom Reports ‐ User customized reports including cloned reports and the custom security events or custom raw logs reports. Our management platform allows us to optimize and administer your perimeter/internet security and provide detailed incident and access reporting. Below are some key elements that are delivered via our services.